NOAA's GOES satellite shows Hurricane Irma as it moved toward the Florida Coast in the Caribbean Sea on Sept. 07, 2017. Irma was a Category 5 hurricane, and in its aftermath, some people want a Category 6. Tom Krall lives on St. John in the U.S. Virgin Islands on the west end of the island, high on a ridge. That's where he was in September when Hurricane Irma roared through. "We had the full blast," Krall says. "Twenty of the 30 houses in my neighborhood lost their roofs or worse." The National Hurricane Center says Irma had sustained winds of 185 mph when it hit the Virgin Islands with gusts of 200 mph or higher. They were the most powerful winds ever recorded in that part of the Caribbean. In his more than 30 years on St. John, Krall has hunkered down for many hurricanes, including other Category 5 storms. He says Irma's winds were dramatically worse than other hurricanes. He knows what winds are like at 150 mph. "It feels kind of like if you're driving in a car at 75 and you stick your head out the window. You've got that kind of an uncomfortable thing in your ears," Krall says. Irma's winds, he says, were much different. "Once you get up around 185, 200, the roar is like you're inside a 747 jet engine. It's extremely intense. You feel it in your gut." Krall says you can prepare for 185 mph winds. He's a carpenter who built and reinforced his house himself to withstand hurricanes. His home came through Irma with just minor damage. But, he and many others in the Virgin Islands believe Irma should have been designated as a Category 6 storm. Currently, the Saffir-Simpson scale, developed in the early '70s by two scientists after whom it was named, only goes up to Category 5, for storms with winds of 157 mph or higher. Scientists say there's evidence hurricanes are getting stronger because of climate change. A new study from the National Center for Atmospheric Research says with rising global temperatures, hurricanes may bring more rain, move more slowly and have higher wind speeds. 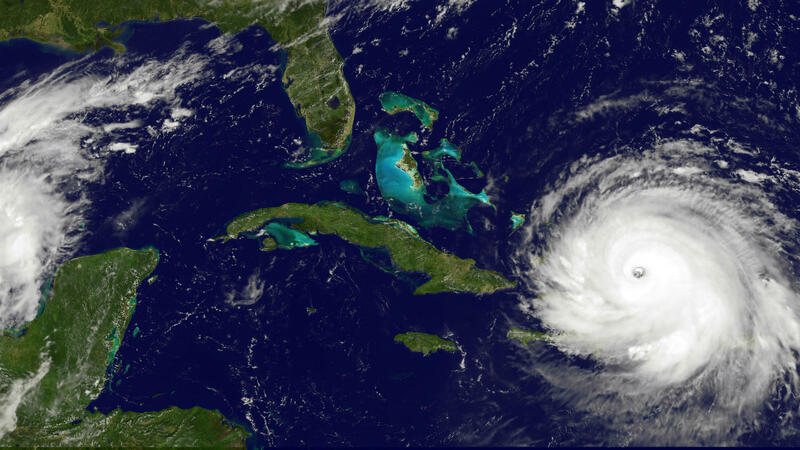 With that in mind, Mike Mann, an atmospheric science professor at Penn State University, thinks it's time to add a new designation, Category 6, to describe more powerful hurricanes, like Irma. "We are seeing a qualitatively different type of hurricane now posing a threat to us and our infrastructure," he says. It's a proposal Chris Davis, a senior scientist at the National Center for Atmospheric Research in Boulder, Colo., has heard before. It's come up after other powerful storms such as Hurricane Allen in 1980 and Hurricane Gilbert in 1988. "When people ask me this question," Davis says, "I simply say, 'Well what would you do to prepare for Category 6 that you wouldn't do for Category 5?' Category 5 is catastrophic damage." That's also the position of researchers at the National Hurricane Center. The purpose of the Saffir-Simpson hurricane wind scale they say is to communicate the level of risk to the public. In hurricanes, Davis says, it's not wind that causes the most deaths, but water. "It is the storm surge, the rainfall, combination of inundation from waves and surge that really kills the most people and does the most damage," he says. There's a growing consensus among atmospheric scientists, although not all are convinced, that hurricanes are getting stronger. In the past three years, the world has seen the strongest wind speeds ever measured in a tropical cyclone in the Pacific, Patricia; the strongest in the southern hemisphere, Winston; and the strongest in the open Atlantic, Hurricane Irma. Mann says as the storms become more powerful, the danger to the public increases. "Frankly," he says, "a 200 mph monster like Patricia, or a 185 mph monster like Irma for that matter, poses a far greater threat than a marginal 157 mph Cat 5 storm." In the Virgin Islands, Tom Krall says most people don't evacuate even in a Category 5 storm. But storms like Irma require special measures. "I think people would behave differently if they knew something like that was coming," he says. Last year, hurricanes devastated Puerto Rico, parts of Florida and Houston. Scientists now say there's evidence hurricanes are getting stronger because of climate change. A new study from the National Center for Atmospheric Research says, with global rising temperatures, hurricanes may bring more rain, move more slowly, and have higher wind speeds. With that in mind, NPR's Greg Allen reports that some researchers want to expand the scale used to classify hurricanes to include a new designation - Category 6. GREG ALLEN, BYLINE: When Hurricane Irma roared through the Virgin Islands, it had sustained winds of 185 mph and gusts 200 mph or higher. Tom Krall has lived on St. John in the Virgin Islands for more than 30 years and has hunkered down for many hurricanes. He says Irma's winds were dramatically worse than other Category 5 storms. He described what winds are like at 150 miles per hour. TOM KRALL: It feels kind of like if you're driving in a car at 75, and you stick your head out the window. You've got that kind of an uncomfortable thing in your ears. But once you to get up around 185, 200, the roar is like you're inside a 747 jet engine. It's extremely intense. ALLEN: Krall and many others in the Virgin Islands believe Irma should be designated as a Category 6 storm. Currently, the Saffir-Simpson Scale, which measures hurricane wind speeds, only goes up to Category 5 for storms with winds of 157 mph or higher. It's time to add a new designation, Category 6, to describe more powerful hurricanes like Irma. So says Mike Mann, an atmospheric science professor at Penn State University. MIKE MANN: We are seeing a qualitatively different type of hurricane now posing a threat to us and our infrastructure. ALLEN: It's a proposal Chris Davis has heard before, after other powerful storms like Hurricane Allen in 1980 and Gilbert in 1988. Davis is a senior scientist at the National Center for Atmospheric Research in Boulder, Colo.
CHRIS DAVIS: When people ask me this question, I simply say, well, what would you do to prepare for a Category 6 that you wouldn't do for a Category 5? Category 5 is catastrophic damage. ALLEN: That's also the position of researchers at the National Hurricane Center. The purpose of the Saffir-Simpson Hurricane Wind Scale, they say, is to communicate the level of risk to the public. But in hurricanes, Davis says, it's not wind that causes the most deaths but water. DAVIS: It is the storm surge, the rainfall, combination of inundation from waves and surge that really kills the most people and does the most damage. ALLEN: There's a growing consensus among atmospheric scientists, although not all are convinced, that hurricanes are getting stronger. In the past three years, the world has seen the strongest wind speeds ever measured in a tropical cyclone in the Pacific, Patricia, the strongest in the Southern Hemisphere, Winston, and the strongest in the open Atlantic, Hurricane Irma. Mike Mann of Penn State University says as the storms become more powerful, the danger to the public increases. MANN: Frankly, a 200 mph monster like Patricia or a 185 mph monster like Irma for that matter, poses a far greater threat than a marginal 157 mph Cat 5 storm. ALLEN: In the Virgin Islands, Tom Krall says most people don't evacuate even in a Category 5 storm. But storms like Irma, he says, require special measures. KRALL: I think people would really behave differently if they knew something like that was coming. ALLEN: Krall says you can prepare for 185 mph winds. He's a carpenter who built and reinforced his house himself to withstand hurricanes. He came through Irma with just minor damage. Greg Allen, NPR News, Miami. Transcript provided by NPR, Copyright NPR.